The inside scoop on NBA basketball. The Boston Celtics have had another successful offseason, luring all-star Gordon Hayward to Boston. General manager Danny Ainge has methodically constructed a roster primed to compete now and in the future. He is also flush with assets, including youngsters Jayson Tatum and Jaylen Brown, Jae Crowder’s cap-friendly contract and a plethora of draft picks, which can be used to acquire additional talent. Hayward joins Al Horford and Isaiah Thomas to give the Celtics a formidable trio. As Ainge continues to search for top talent, two lingering questions hang over the team: Do the Celtics need a superstar to win a championship? And, if so, do they currently have one on their roster? The first question hinges on the meaning of the word “superstar,” a vague term used loosely by sports fans and journalists that has been co-opted by sneaker companies and other commercial brands. In a general sense, a superstar is a player who can dominate a game and carries his team on a regular basis. A more precise definition is tougher to nail down. Some people believe that the term superstar should be reserved for athletes who are capable of being the best player on a championship team. Of course, that is a circular argument for our purposes. It also excludes legendary competitors such as Elgin Baylor, Charles Barkley and Karl Malone. We could use the Hall of Fame as a means for distinguishing superstars, though it would be difficult to predict which current players will be enshrined in Springfield. That approach also would not account for players who performed at a Hall of Fame level the season their team won the championship, but fell short of the Hall. Then there are Hall of Famers like Robert Parrish and Joe Dumars who were great players on championship teams, but were not dominant. Should we confine use of the word superstar to the top five or 10 players in the game? And, if so, how should those rankings be determined? The best means of assessment may be to look at Player Efficiency Ratings (PER) or All-NBA First Teams. Since the NBA implemented a salary cap prior to the 1984-85 season, only seven teams have won a championship without a player making the All-NBA First Team: the Detroit Pistons in 1989, 1990 and 2004, the 1995 Houston Rockets, 2011 Dallas Mavericks, 2014 San Antonio Spurs and 2017 Golden State Warriors. Hakeem Olajuwon (All-NBA Third Team) won MVP and Defensive Player of the Year while leading the Rockets to the championship the year before the 1995 championship. Mavs forward Dirk Nowitzki (All-NBA Second Team) also had an MVP to his credit and had been named to the All-NBA First Team in four previous seasons. Kevin Durant and Stephen Curry of the Warriors have three MVPs between them. 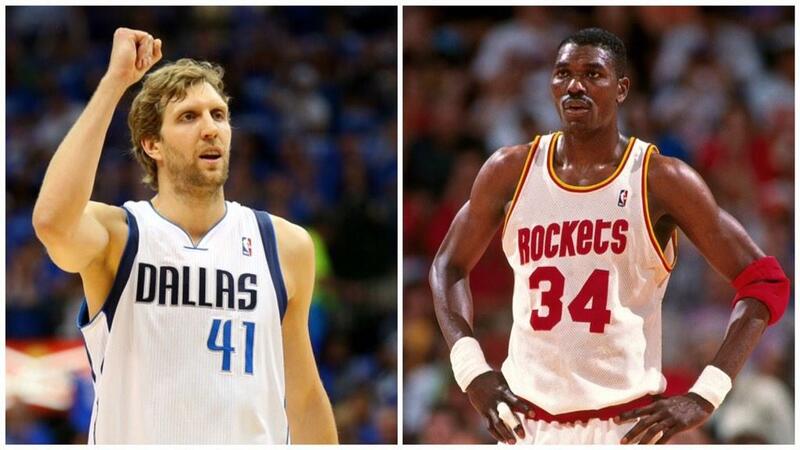 It is hard to argue that Hakeem, Dirk Curry or Durant were not superstars. The 1988-89 and 1989-90 Bad Boys Detroit Pistons had three future Hall of Famers in Isiah Thomas, Joe Dumars and Dennis Rodman. Isiah is one of the greatest point guards in league history and was selected to three All-NBA First Teams. That leaves just the 2003-04 Pistons and the 2013-14 Spurs. 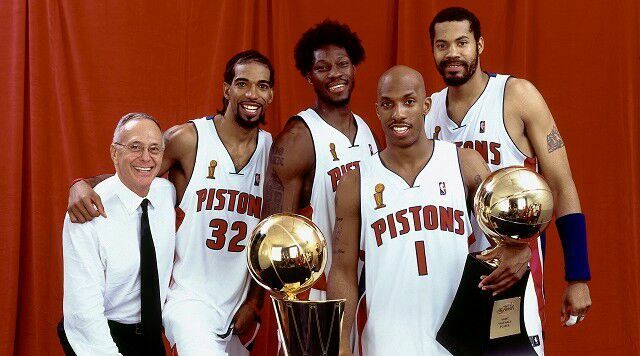 Ben Wallace was the lone All-NBA selection (Second Team) from that Pistons team. Wallace was Defensive Player of the Year four times, but was never selected to an All-NBA First Team and was not capable of carrying a team. The 2014 Spurs were in a transition period between the end of one of dominant career, Tim Duncan’s, and the rise of another superstar, Kawhi Leonard. Tony Parker was named to All-NBA second team, and he and Duncan tied for 12th in the MVP voting. Not exactly superstar numbers. Now let’s examine PER as a measuring stick for superstardom. Over the past 50 years, only nine championship teams failed to have a player rank in the top ten in PER: the 1968, 1969 and 1974 Boston Celtics, 1978 Washington Bullets, 1979 Seattle SuperSonics, the 1989, 1990 and 2004 Pistons and the 2014 Spurs (via basketball-reference.com). The 1968 and 1969 Celtics were anchored by the great Bill Russell. The 1974 team had John Havlicek and Dave Cowens. The 1978 Wizards boasted an overpowering front line of 12-time All-Star Elvin Hayes and 1969 MVP Wes Unseld, and the Pistons of ’89 and ’90 were led by Isiah Thomas, a 12-time All-Star. That leaves just the 1978-79 Sonics, and once again, the 2003-04 Pistons and 2014 Spurs. Based on multiple indicators, it is fair to say that all three teams lacked a superstar. Dennis Johnson, a defensive standout who won two more rings with the Celtics, is the lone Hall of Famer from that Seattle team. Gus Williams and Jack Sikma had great careers with the Sonics and other franchises, but were never among the elite players in the game. Four of the Pistons starters, Chauncey Billups, Ben Wallace, Rasheed Wallace and Richard Hamilton made multiple All-Star appearances. Billups, considered by many the team’s best player, is a borderline Hall of Famer. Neither he nor Dennis Johnson dominated. Duncan and Manu Ginobili were past their prime by 2014. Parker was a great player, but hardly a transcendent star. Leonard would go on to be named Defensive Player of the Year, MVP finalist and All-NBA First Team, but despite being winning Finals MVP, he was not yet a superstar in 2014. So while it is possible for the Celtics to win a championship without a superstar, it is highly unlikely that they will do so. Hayward and Horford are very good, well-rounded players, but they are not elite talents. Tatum and Brown could blossom into superstars, though statistically speaking, that is unlikely. That leaves Thomas, who performed like a superstar this season. The point guard averaged 28.9 points per game, including 9.8 points per fourth quarter. He put constant pressure on defenses with a league-high 12.7 drives per game and 8.5 free throws per contest. IT finished seventh in PER (26.5) and fifth in the MVP voting, while being named to All-NBA Second Team. From an objective standpoint, that is superstar production. However, Thomas needs to prove that he can do it for more than one season, particularly as the Celtics add more talent around him and the ball is in his hands less frequently. That may be difficult for a player who does not provide much value on defense or the boards. The case against Thomas being a superstar comes on the defensive end of the court, where he appears lost at times in pick-and-roll situations. His diminutive stature (5’9) is also a liability. The Washington Wizards abused him in the post during their second-round playoff matchup with the Celtics. IT’s lack of height could also become a problem offensively against longer teams like the Cleveland Cavaliers and Golden Warriors, who will trap him in hopes of forcing turnovers. Ainge is going to keep dealing, but superstars are hard to come by. There do not appear to be any on the market right now. The Celtics must hope that Thomas can be the superstar they need, and if Ainge is able to swing a deal for another, two is better than one. Rookie Kristaps Porzingis entered the season as a mystery to Knicks fans. 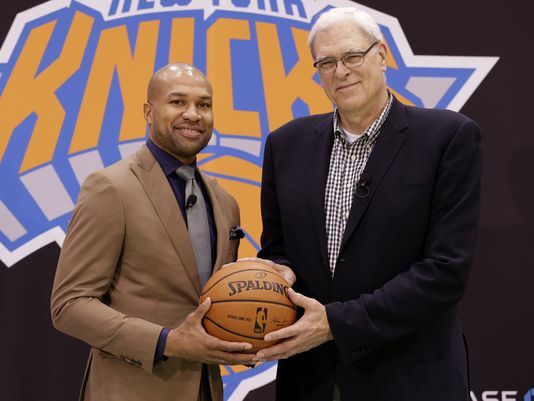 The New York Knicks hope to turn a corner in the second season of the Phil Jackson/Derek Fisher era after a franchise worst 17-65 record in 2014-15. New York added eight new players in the offseason, including first-round draft picks Kristaps Porzingis and Jerian Grant, and Carmelo Anthony is back in the lineup after undergoing season-ending knee surgery in February. The Knicks split their first two games, blowing out a shorthanded Milwaukee Bucks team 122-97 Wednesday night, before dropping their home opener 112-101 to a well-oiled Atlanta Hawks team the following evening. This team is a work in progress, as Coach Fisher continues to figure out the most effective lineups and the best way to utilize his talent. 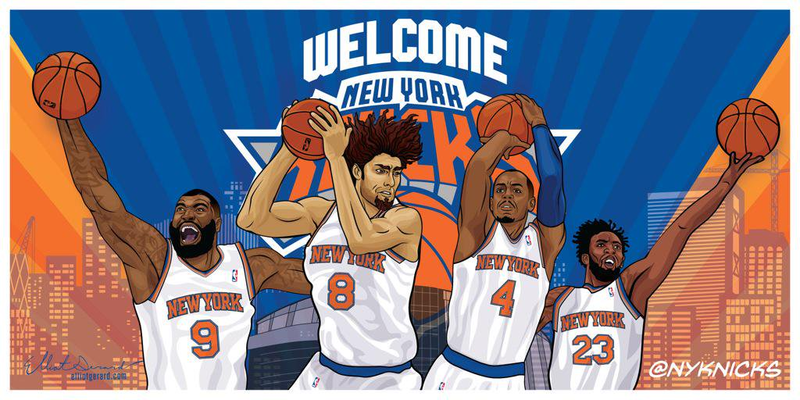 However, there is plenty of insight to be gleaned from the Knicks’ first two performances. 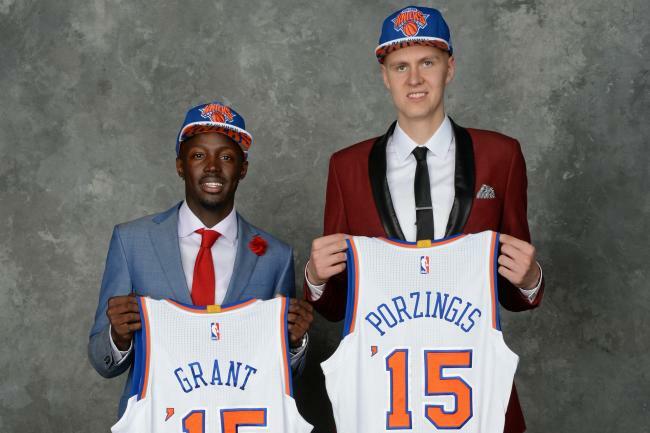 Rookies Kristaps Porzingis and Jerian Grant hope to change the course of the franchise. In any other season, the biggest story in Knicks training camp would have been Anthony’s recovery from knee surgery, but New York fans’ curiosity has centered on the 7’3” Porzingis since the Knicks passed up better-known American talent to select the then 19-year-old Latvian with the fourth pick in the draft. The Zinger was New York’s highest draft pick since Patrick Ewing was selected first overall in 1985 and could determine the fate of the franchise for the next dozen years. He has drawn comparisons to everybody from future Hall-of-Famers Pau Gasol and Dirk Nowitzki to notorious busts Shawn Bradley and Andrea Bargnani. 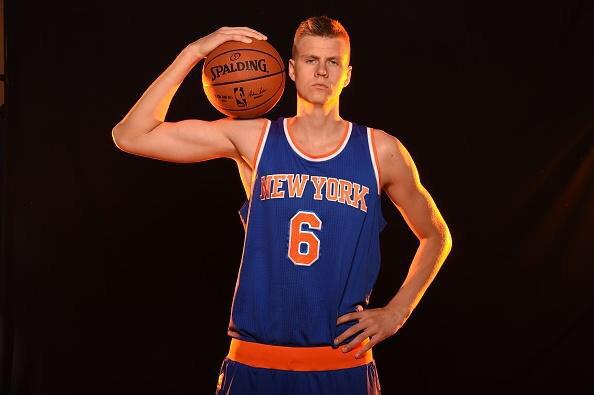 After two games, it is apparent that Porzingis is highly skilled for his size. The Latvian has a nice touch around the basket and though he has connected on just one of six three-point attempts, he has looked comfortable launching from well beyond the arc and nailed 36 percent of his long balls for Sevilla in Spain last year. Porzingis has a surprisingly tight handle and moves very well for a seven-footer, as displayed in this highlight steal, spin and flush against the Hawks. There is a litany of skilled seven-footers who have gone bust in the NBA. (See Andrea Bargnani and Darko Milicic.) It is too early to say for certain which direction Porzingis’ career will go, though there are two promising signs that he will be more Dirk than Darko: he appears to love the game and he has a little dog in him. When asked by scouts what most excites him about life in the NBA, Porzingis replied, “I think it’s pretty cool you can get into the gym at any time. You don’t have that option in Europe. So that’s pretty exciting.” via Herring of WSJ.com While that answer may sound canned, all reports by ex-teammates and coaches support the sentiment. Porzingis has also demonstrated some fight through the first two games. Despite his frail frame, he has repeatedly driven into traffic and banged with bigger bodies, instead of shying away from contact. It will take a few years for him to learn the intricacies of NBA basketball, e.g. when and how to assert himself offensively, when to pull up for a jumper rather than forcing the drive, how to avoid foul trouble, the nuances of the Triangle Offense, etc. He also desperately needs to put on weight, as he is currently not strong enough to exploit his size on the block, forcing him to drift out to the perimeter. Porzingis’ ideal role as he continues to fill out is as a pick-and-pop player. The Wall Street Journal’s Chris Herring makes a compelling argument that Zinger should be playing more time with the second unit, which uses more pick-and-roll sets. The trade that sent Tim Hardaway Jr. to the Atlanta Hawks for the 19th pick in the draft may have been the shrewdest move of Jackson’s tenure as President of the Knicks. New York used the pick to nab point guard Jerian Grant. Throughout the preseason and the Knicks’ first two games, Grant has demonstrated an excellent feel for the game. He knows how to run an offense and has compiled five and seven assists, respectively, in limited action during the first two games. Grant’s quickness provides a new dimension to the Knicks’ attack. He has instilled pace into a second unit, which outplayed the starters over the first two games and is the only Knick who can consistently break down a defense by driving into the paint. Fisher has adapted the second unit’s offense to include more pick-and-rolls in order to accommodate Grant’s strengths. Grant’s inexperience has been evident at times, specifically with some sloppy passes against the Hawks. He has also missed some easy layups after electrifying drives to the rim. Teams are going to go under screens against Grant until he proves that he can consistently knock down the three ball. Fisher will likely keep Grant with second unit based on that groups success, but do not be surprised if Grant is closing games for the Knicks in the near future. 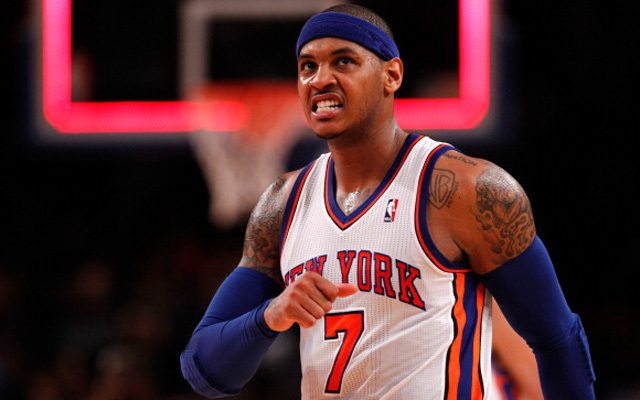 Carmelo Anthony may take a while to find his game after knee surgery. 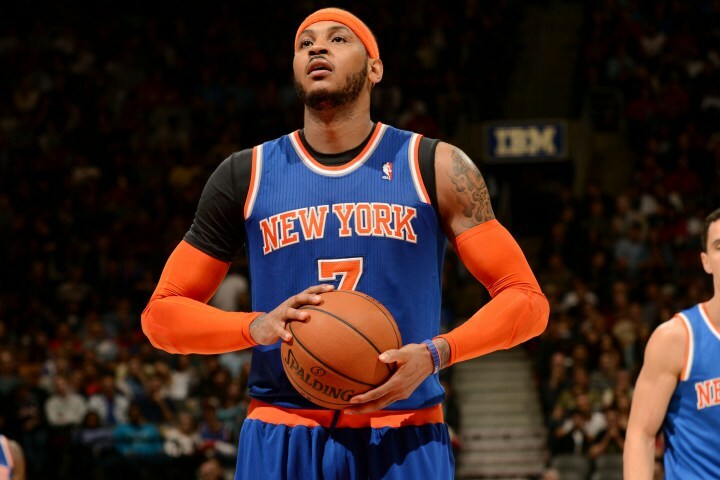 Carmelo Anthony has no spring in his legs, which is not surprising after knee surgery. He is shooting just 33 percent from the floor, including 1 for 12 from downtown. It may take Melo a couple of months to get his legs underneath him. In the meantime, expect the eight-time all-star to use his strength to bully his way to the basket, as he did against the Hawks. There has to be at least some concern that at age 31, with a lot of mileage on his legs, Anthony will never fully regain the explosiveness that made him such a devastating scorer. Coach Fisher is expecting an immediate impact from the team’s free-agent signings. Starting shooting guard Arron Afflalo missed most of training camp and the first two games with a strained left hamstring. The injury is not considered serious, but hamstring injuries tend to linger. The Knicks are counting on Afflalo to be a consistent second option to go with Anthony. Robin Lopez is as advertised. He is not exceptionally long or a great leaper, but is an intelligent defender who knows how to cover angles and use his body effectively. Lopez showed off a right and left-handed hook shot while putting up 19 points against the Hawks. He and his backup, Kyle O’Quinn, bring a grittiness to the team that was sorely lacking last season. O’Quinn may have been a steal for the Knicks at $16 million over four years. The bruising big-man has about the same vertical leap as my 96 year-old grandmother, but he has six fouls and he knows how to use them. O’Quinn was quietly effective during his four seasons with the Orlando Magic, averaging 13 points and 10.6 rebounds per 36 minutes and has made the most of a bigger role with the Knicks. He grabbed double-digit boards in each of the first two games. He knocked down an eighteen-foot jumper against the Hawks and even delivered a couple of nifty drop passes for layups out of the triangle. Old School Knicks fans had to delight in the site of the Queens native exhorting his teammates on while trailing the Hawks by 22 late in the third quarter. That is the attitude the Knicks need as they transform a losing culture. Derrick Williams is looking to create a niche in the league after a disappointing start to his career. The second pick in the 2011 draft led the Knicks in scoring in the preseason with 15 points per game. Williams put up 24 points on 8 of 17 shooting in the opener and could thrive as the No. 1 option on the second unit. The hybrid forward needs to stop settling for outside jumpers, where he is below-average shooter (30 percent from downtown for his career), rather than using his athleticism to get to the rim. Coach Fisher needs Williams increase his presence on the boards and become a more active defender. 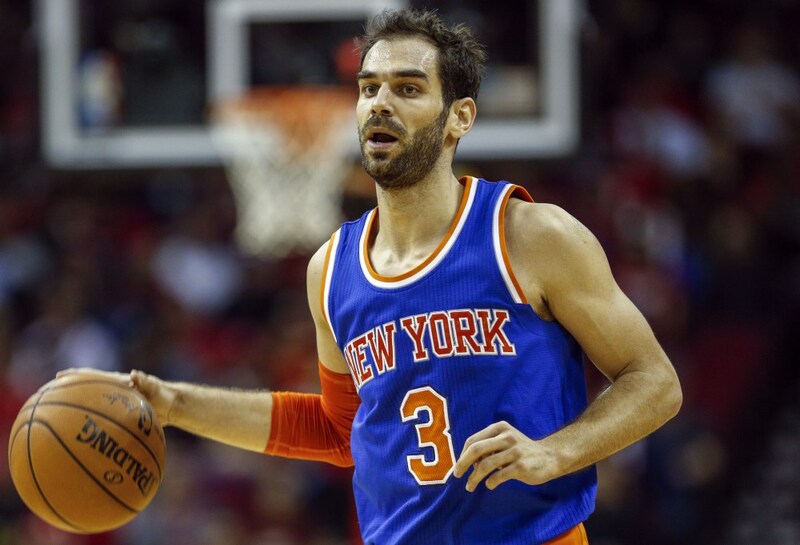 Jose Calderon’s days as a starter may be numbered. New York started veterans Jose Calderon and Sasha Vujacic in the first two games, though both could find themselves on the bench before long. Vujacic, who played in Europe most of the past four year, is a spot starter while Afflalo’s hamstring recovers and could find himself out of the rotation when Afflalo returns. Vujacic has a strong understanding of the Triangle Offense and can knock down an open three, but offers little else offensively, and he and Calderon are a liability defensively. Calderon may be done. The point guard attributed his poor 2014-15 season to a nagging Achilles injury, but he has not looed any better in the early going. Quickness was never the Spaniard’s forte, and at age 34, he cannot even keep backup points guards out of the lane. He takes care of the basketball and is still an above-average three-point shooter, but it is difficult to keep him on the floor, when he cannot penetrate or defend the pick-and-roll. Look for Grant or second-year guard Langston Galloway to take Calderon’s late-game minutes and possibly his starting spot. Galloway can play both guard positions and is not afraid to take a big shot. He appears to be developing chemistry with Grant who has hit him for several open jumpers. The next step in his development is to incorporate more dribble-drive into his game and put greater pressure on opposing ball-handles. New York is still unlikely to snag a playoff spot in the inferior Eastern Conference. They lack reliable second and third options and Lopez is probably the only plus defender in the starting lineup. However, the team is headed in the right direction. They added much needed depth and a number of high-character players whose attitudes alone will make the team more competitive. The development of the two rookies and Galloway should also make the Knicks fun to watch. One year ago today, New York Knicks owner James Dolan served the team’s long-suffering fan base the latest version of his favorite dish, hope, with a side of nostalgia, when he hired Phil Jackson as team President. Sure, Jackson did not have any front office experience, but as Dolan was quick to point out, he won two rings as a player with the Knicks and 11 more as a coach. 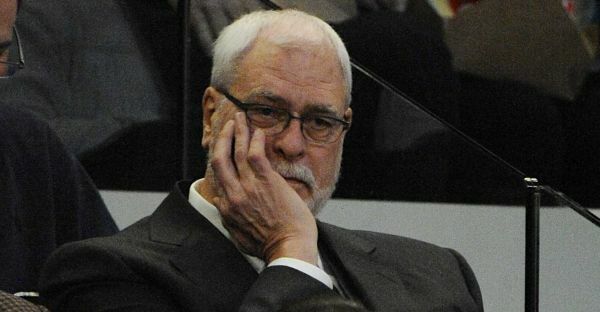 Knicks fans were optimistic that Jackson’s gravitas could hold the meddlesome owner away from basketball decisions, while simultaneously attracting big-name free agents to the Garden. One year into the job, that hope has faded. 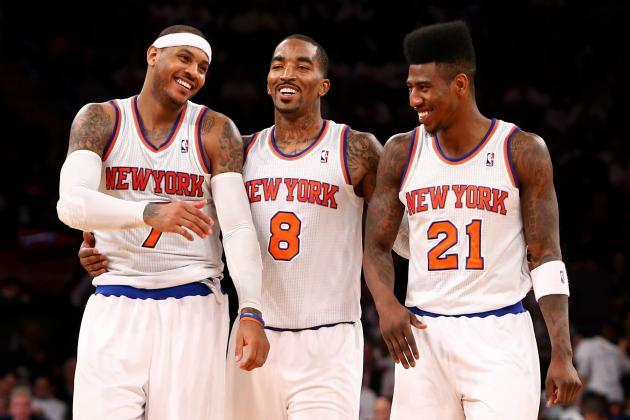 Surprisingly, it is not the Knicks’ league-worst 14-53 record that has Knicks fans worried. Contrary to popular belief, New Yorkers are willing to endure a rebuilding process, and are excited about the prospect of a top-three draft pick for the first time since the team selected Patrick Ewing first overall in 1985. The concern is Jackson, who has yet to demonstrate that he is capable of running a front office, evaluating talent or making shrewd personnel moves. In fact, all signs point to the contrary. The Zen Master inherited a capped-out roster with Carmelo Anthony expected to opt out of his contract and just three additional assets to work with, Tyson Chandler, Iman Shumpert and Tim Hardaway Jr.
Jackson initially appeared willing to play hardball with Anthony, publicly challenging the star forward to accept less than a maximum-salary contract in order to help the Knicks build a contender. But the President of the Knicks soon caved. New York signed Anthony to a five-year, $124 million deal, just $5 million below the maximum, and still $28 million more than any other team could offer. Anthony is a sensational scorer, though merely average at just about every other facet of the game. He is a major piece of a puzzle, not the pillar of a franchise. You only sign a player of his caliber with 11 NBA seasons under his belt to an essentially maximum-salary contract if you believe your team is close to contending. That points to Jackson’s first major miscalculation. His initial impression of the Knicks, which he expressed during his introductory press conference and again in the preseason, was that the team could compete for the playoffs this season. Following a competitive 2014-15 campaign, Jackson would use the cap space at his disposal in the summer of 2015 to turn the roster into a contender. The hall-of-fame coach should have known that it was unrealistic to expect a collection of players who were not in the team’s long term plans to buy into an offensive system (The Triangle) which was a poor fit for their individual styles of play and takes years to master. The result has been the worst season in franchise history. To make matters worse, Anthony underwent season-ending knee surgery in February. Jackson is now caught between maximizing the elite years of a star on a “win-now” contract and a team that desperately needs to rebuild. One also has to wonder if Anthony, a shot-happy forward on the wrong side of 30, will help or hinder Jackson’s recruiting efforts over the next two summers. As for those three assets Jackson inherited, Chandler and Shumpert were traded and Hardaway’s value has all but disappeared. 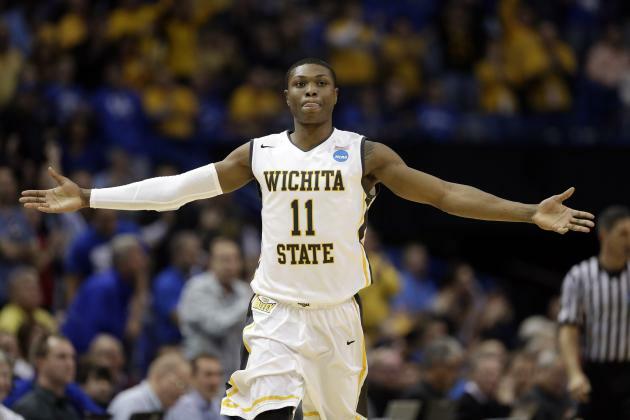 All Jackson has to show for them is Cleanthony Early, Thanasis Antetokounmpo and a future second-round draft pick. 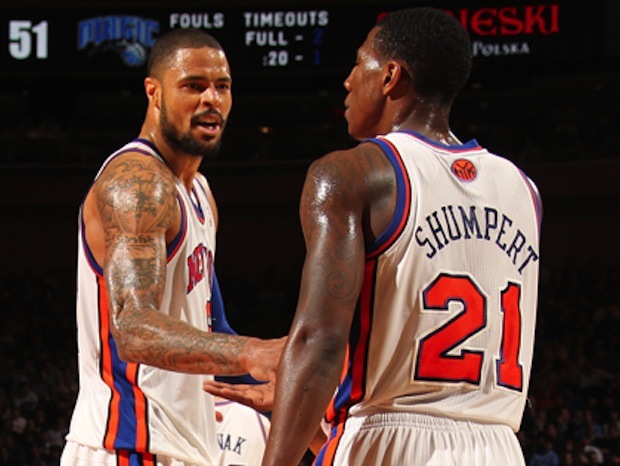 Jackson received virtually nothing in return for Chandler and Shumpert. Jackson packaged Chandler in a trade with the Dallas Mavericks designed to dump Raymond Felton. The Knicks received two second-round picks (which they used on Early and Antetokounmpo), Jose Calderon, Samuel Dalembert, Shane Larkin and Wayne Ellington. Compare that to the two first-round picks the Denver Nuggets received for center Timofey Mozgov, who is inferior to Chandler on both ends of the floor, in January. Chandler is averaging 10.4 points and 11.5 rebounds for a playoff team. New York declined the third-year option on Larkin, traded Ellington immediately, and released Dalembert in January. Early is shooting 34 percent from the field in an injury-plagued rookie year, and Antetokounmpo has yet to earn a call-up from the D-League. Calderon has been so disappointing that Jackson reportedly tried to deal him before the trade deadline, via Ian Begley of ESPNNewYork.com. The Spaniard is scheduled to make $15 million over the next two seasons. New York would be better off with Felton, whose contract expires in 2016. In January, Jackson used Shumpert to entice the Cleveland Cavaliers to take J.R. Smith off his hands, receiving a future second-round pick in return. Both Shumpert and Smith are key contributors on a Cavs team that has had the best record in the league over the past two months. Hardaway looked like a future starting 2-guard after an impressive rookie season and was an attractive commodity last summer. 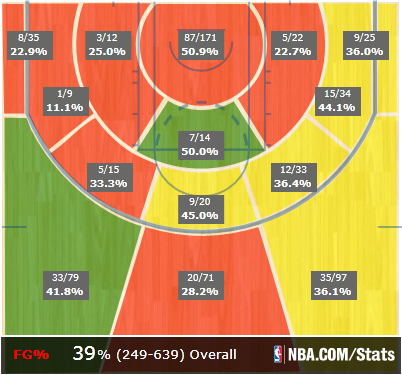 His shooting percentage has plummeted to 39 percent this season, as seen in the chart below, via NBA.com. Considering that he does not pass, rebound or defend, he carries little value for the Knicks or any other team. New York’s personnel decisions are indicative of a franchise that lacks experience and structure in the front office. Jackson is a novice executive, and general manager Steve Mills had not worked in basketball operations before last year. Neither has the type of connections around the league that facilitate deals. Bleacher Report’s Howard Beck reported in January that one Western Conference executive said, “No one has Steve Mills’ phone number.” Another executive indicated that unlike most teams, the Knicks have no one who regularly calls around to gauge the value of players, or to get a sense of who is available. Jackson has accepted blame for the team’s horrid season. The Zen Master issued a mea culpa following the Shumpert/Smith trade. “I take responsibility for it,” he said, via Al Iannazzone of Newsday.com. There is still an opportunity for him to build a contender in New York. He has Carmelo Anthony, a top draft pick this year and a ton of cap space over the next two summers to work with. But, tearing down a roster was supposed to be the easy part. Jackson has not provided any reason to believe that he can build one. Former 13-year NBA veteran Anthony Mason is fighting for his life after suffering congestive heart failure and undergoing five heart procedures in recent days, according to Peter Vecsey. His oldest son, Mason Jr., told MSG Network’s Tina Cervasio on Saturday that his 48-year-old father is in stable condition. Mason, best known as the barrel-chested bruiser from the rugged New York Knicks teams of the early 1990s, is a colorful character whose game was as unique as his myriad hairstyles. He is also a fighter. Mason was not heavily recruited out of high school before attending Tennessee State University. He was cut by the Portland Trail Blazers months after they selected him in the third round of the 1988 draft. Then he spent three years as a basketball nomad, playing in Turkey, Venezuela, the CBA, and the USBL, along with brief stints with the New Jersey Nets and Denver Nuggets. The Queens native finally found his niche in the N.B.A. with his hometown Knicks in the fall of 1991. New York’s new coach, Pat Riley, wanted to assemble a physical, defensive-minded roster, reminiscent of the “Bad Boy” Detroit Pistons team that swept his Los Angeles Lakers in the 1989 Finals. Mason’s tenacity and intimidating presence was exactly what Riley was looking for. At six-foot-seven, 260 pounds, Mason had the bulk of a bodybuilder and a scowl to match. He and fellow castaway, John Starks, competed with a sense of desperation that invigorated their teammates and the fan base, and they quickly became integral members of Riley’s rotation. Over the next four seasons, “Mase and Oak” (Charles Oakley) bullied opponents on the boards and in the paint, freeing up New York’s star center, Patrick Ewing, to score. The formidable frontcourt led the Knicks to the N.B.A. Finals in 1994. Mase was named NBA Sixth Man of the Year the following season. Mason’s role extended far beyond that of enforcer. He was remarkably agile for his size, and his ability to corral opposing guards combined with the strength to push big men off the block made him a valuable defender. During the 1994 playoffs, Mase checked athletic Chicago Bulls forward Scottie Pippen in one series, before frustrating Houston Rockets center Hakeem Olajuwon in the Finals. The burly forward possessed a surprisingly deft handle and excellent court vision. Knicks fans grew accustomed to the sight of Mase grabbing a defensive rebound and dribbling between his legs, while pushing the ball up the floor, before delivering a crisp chest pass into the shooting pocket of an open guard on the wing. Riley’s successor, Don Nelson, was so impressed with Mason’s passing that the Hall of Fame coach ran the Knicks’ offense through him during the 1995-96 season. The versatile forward also played a league-high 42.2 minutes per game that season. Mason used his solid frame to back down defenders on the block, where he was adept at finishing with either hand, though his range was limited to a few feet from the basket, beyond which the lefty resorted to an ugly push shot. His one-handed free throws were comical, and at times difficult to watch, though he somehow managed to complete 71 percent of them. 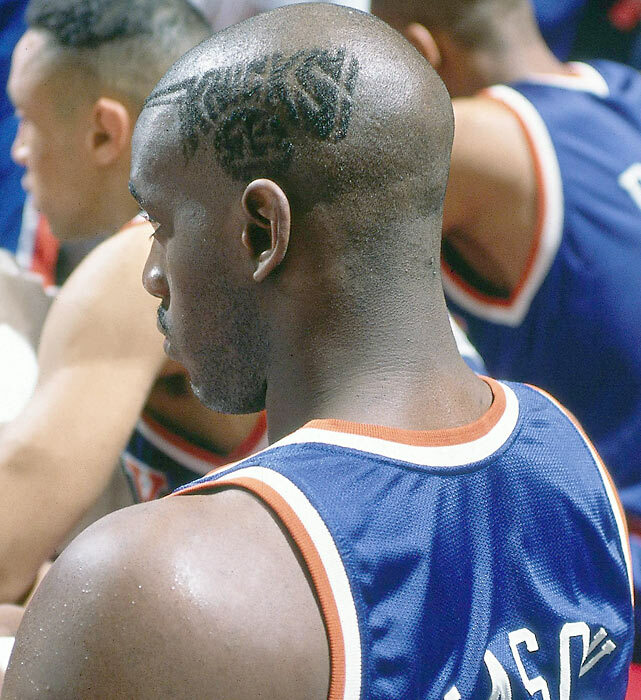 The pugnacious forward also had a playful side, and his funky hairstyles, which consisted of various messages shaved into his head, from “Mase” to the Knicks logo, to motivational phrases, drew media attention. Local newspapers and national magazines did feature stories on his barber, Freddie. Mason was a bit of a rabble-rouser off the court. He was arrested for scuffling with a police officer during his tenure with the Knicks, and the defiant attitude that made him such a menace on the court grated on his coaches. In July, 1996, New York traded Mason and Brad Lohaus to the Charlotte Hornets for Larry Johnson. Mason produced his finest statistical season in 1996-1997 for a Hornets team that won 54 games, joining Kareem Abdul-Jabbar, Kevin Garnett, Charles Barkley, Larry Bird and Bill Walton as the only players in the past 40 years to average over 15 points, 11 rebounds and five assists per game (16.2, 11.4 and 5.7), via basketball-reference.com. Once again, Mase led the league in minutes per game (43.1). He was named to the All-N.B.A. Third Team and finally received recognition for his stellar defense with an N.B.A. All-Defensive Second Team selection. Mason was traded to the Miami Heat in 2000, where he was reunited with Riley. He scored 16.1 points and grabbed 9.6 rebounds per game in 2000-01, while often defending opposing centers with Alonzo Mourning out of the lineup. At age 34, he was named to his first and only All-Star Game. Mase concluded his career with the Milwaukee Bucks in 2003. Despite the various uniforms, he will always be remembered as a Knick. The Frazier, Reed and Bradley squads of the 1970s set the standard of excellence for New York basketball, though the Knicks teams of the 90s forged their own special bond with the city. After 15 years of incompetence, underachieving and a general malaise, which hangs like a fog over Madison Square Garden, Knicks fans long for the passion of Mason, Starks, Oakley and Ewing. 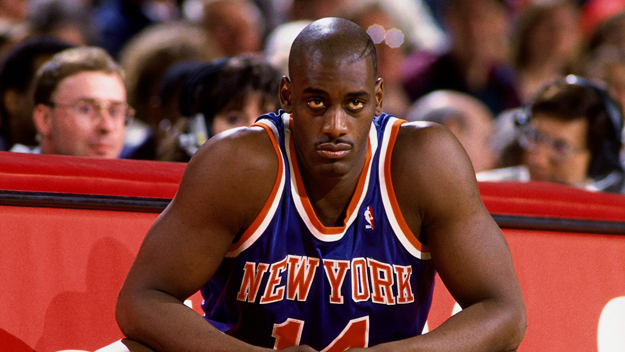 Anthony Mason is a product of New York City and competed with a tenacity and swagger that resonated with New Yorkers and gave credence to basketball’s moniker, “the city game.” Knicks fans hold Mase in their hearts, knowing that he will not stop fighting for his.